In 1911, Peyton Rous discovered that cancer could be induced in healthy chickens by injecting them with a cell-free extract of the tumor of a sick chicken. He ground up samples of the tumor and passed the material through a filter with pores so fine that not even bacteria could get through. However, the tumor filtrate was able to induce cancer when injected into chickens. This was the first demonstration of an oncogenic virus — that is, a virus capable of causing cancer. The tumor was a sarcoma, a tumor of connective tissue. The virus was named the Rous sarcoma virus (RSV). The Rous sarcoma virus is a retrovirus (as is HIV, the virus that causes AIDS). The genes of retroviruses are encoded in RNA, not DNA. However, the virus contains a reverse transcriptase, a DNA polymerase that uses RNA as its template. 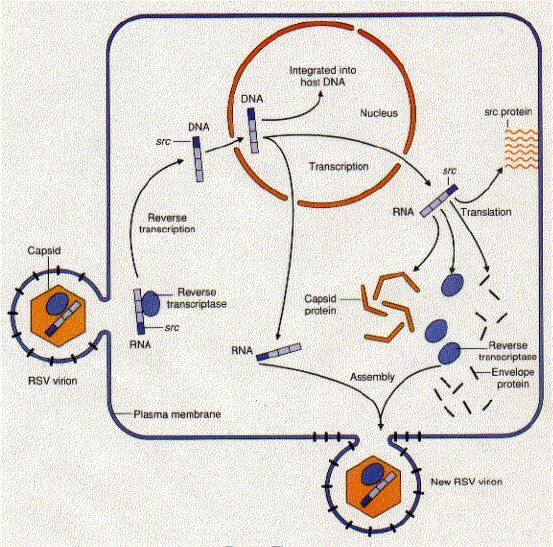 As soon as RSV infects a cell, its reverse transcriptase synthesizes DNA copies of its genome. These enter the nucleus of the cell and insert themselves randomly throughout the DNA of the host's chromosomes. Normal gene transcription within the nucleus now produces an RSV messenger RNA (mRNA) that reenters the cytoplasm. Some copies of this mRNA are then translated by the normal machinery (e.g., ribosomes) of the host cell into protein products. Other copies of the RNA become incorporated into new virus particles. src, which encodes a tyrosine kinase, an enzyme that attaches phosphate groups to Tyr residues on a variety of host cell proteins. they act as enhancers, causing the host nucleus to transcribe the RSV genes at a rapid rate. The expression of this gene in some way — still only dimly understood — is able to transform cells in culture. View transformed and normal cells in culture. At 35°C the protein encoded by src is active and the host cells transformed. 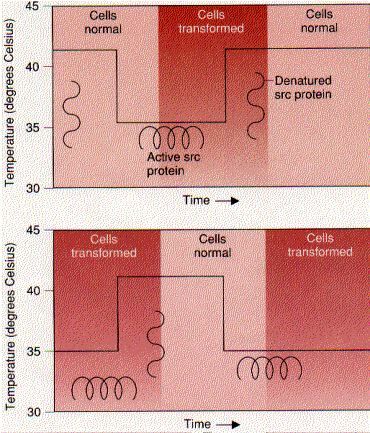 At 41°C the protein is denatured and the cells grow normally; that is, show contact inhibition, etc. The process is reversible. The cells can be quickly and repeatedly switched from one state to the other simply by changing the temperature. It is now clear that the seeds of cancer lie within us. The human genome probably contains more than a hundred genes that if mutated have, in one way or another, the potential to participate in causing the cell containing the mutation to become cancerous [Examples]. Because cancer represents a loss of control over mitosis, it is not surprising that in their normal state, many of these genes are involved in some aspect of mitosis. These images provide powerful support for the idea that oncogenes are related to normal cellular genes. The DNA copy that reverse transcriptase makes from RNA is called complementary DNA or cDNA. Like, most eukaryotic genes, c-src is a split gene, containing multiple exons separated by introns; v-src is not split [View]. v-src genes always contain mutations that distinguish them from the c-src of the chicken. 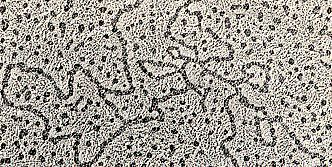 The electron micrograph (courtesy of J. M. Bishop) shows the hybridization between single-stranded DNA from normal chicken cells and the single-stranded DNA of v-src. The graphic shows its interpretation. 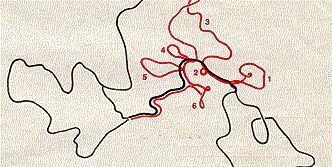 The loops represent introns in the cellular gene (the numbers correspond to those in the earlier figure). It turns out that src-like genes are found throughout the animal kingdom, among vertebrates (ours is on chromosome 20 and is designated SRC) and invertebrates (e.g., Drosophila) alike. This tells us that src must be a very important gene that arose early in evolution and has been retained with little change since. Thus the term proto-oncogene should not imply that the normal function of the gene is a harmful one. For example, mice homozygous for a mutant allele of the proto-oncogene c-abl have a variety of abnormalities and die within a week or two of birth. Whatever the c-abl product (also a tyrosine kinase) is doing, clearly it is essential to life. The src gene is not necessary for the survival of RSV. RSV particles can be isolated that have only the gag, pol, and env genes [middle figure above]. These have perfectly normal life cycles (but cannot transform their host). So how and why did RSV acquire its src gene? Whenever the DNA of RSV happens to insert itself near the cellular c-src gene of its host, RNA polymerase II might occasionally read past the end of the env gene and transcribe the c-src gene as well. The c-src introns would be removed by normal RNA processing, producing a mRNA encoding the four genes. This would then slip into one of the virus particles being assembled. So RSV has stolen a gene from its host. One further step remains before RSV can become oncogenic: certain mutations in src. Reverse transcriptase lacks the proofreading abilities found in normal DNA synthesis so errors (= mutations) in v-src can easily accumulate. RSV, like all viruses, requires host cells in order to complete its life cycle. It is easy to see that a virus that has added v-src to its genome will have a strong advantage over those that have not. By stimulating uncontrolled mitosis in its host, it provides a growing population of cells available for fresh infection.